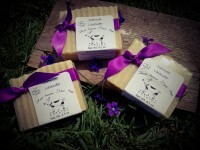 Soap is made from milk from our goats. Goat milk offers some hydrating benefits, especially for anyone with dry skin. Because the pH levels of goat milk are the same as the human epidermis, it can moisturize while cleansing and possibly eliminating any acne-causing bacteria. In addition, it contains some beneficial nutrients that offers a supple complexion. Vitamin A is famous for the help it provides to repair damaged skin tissue.